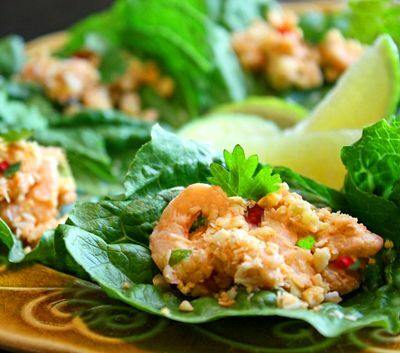 If you're looking for a deliciously different shrimp dish, try making up a platter of these Thai shrimp mini lettuce wraps! These bite-size wraps are just perfect for a party finger food (great with beer, as well as wine and cocktails), or make up a batch as an entrée for dinner. Each mini wrap provides a burst of Thai flavors that are meant to hit different parts of the palate all at once. Based on the traditional Thai appetizer miang kum, this fresh Thai appetizer is sure to be a hit with Thai food fans or anyone who has an adventurous spirit for spicy and flavorful foods. Place coconut in a dry wok or frying pan set over medium-high heat. Dry-fry it by stirring continually until it turns light golden-brown and is fragrant. Immediately transfer your toasted coconut to a bowl and set aside to cool. Whether you're using fresh or frozen baby shrimp, make sure they are well drained (gently squeeze out any excess water with your hands). If using larger shrimp, chop them up into small pieces. Place shrimp in a mixing bowl. Add most of the ground or finely chopped peanuts to the mixing bowl, reserving 1 tablespoon for garnish. Now add the spring onions, garlic, galangal or ginger, chili, chili powder, sugar, and fish sauce. Stir or toss everything together well in the bowl. Add the coconut milk and gently stir again. Finally, add the toasted coconut, reserving 1 tablespoon for garnish. Stir again. Taste-test this mixture. You should taste a combination of spicy and salty, plus a hint of sweetness (there also will be a slightly sour note later when the lime juice is added). If you'd like it saltier, add a little more fish sauce. If too sour for your taste, add a little more sugar. If you prefer more coconut flavor, add 1 more tablespoon coconut milk (don't add too much, though, or it will soak through the lettuce leaves—you want a sandwich-spread consistency). To assemble the appetizer, chop off the tops of 12 romaine lettuce leaves (3- to 4-inch pieces) and set on a platter. Scoop 1 heaping tablespoon of the shrimp mixture onto each leaf. Now top each one with a sprinkling of the reserved ground peanuts and toasted coconut. Add a final sprinkling of fresh coriander, and serve with the lime wedges (set these in a small pile in the middle of the platter). When ready to eat, squeeze some lime over the shrimp mixture, then wrap up and enjoy a bite-size explosion of Thai flavors. This recipe is a spin on the classic Thai appetizer, miang kum. The appetizer is meant to literally "wake up the taste buds" in preparation for other Thai dishes to follow. The original recipe is prepared with tiny dried shrimp which, we have found, are either impossible to locate here in North America, or, when they are found, they are of such poor quality (rubbery), they are impossible to eat. We, therefore, came up with this fresh version which is better suited to the shrimp readily available in the States. 'Miang Kham' - Amazing Traditional Thai Dish!